An inviting wraparound porch surrounds the welcoming facade of this three-dormered, one-story farmhouse. A cathedral ceiling enhances the great room where a clerestory dormer bathes the room in natural light and built-ins flank the fireplace. 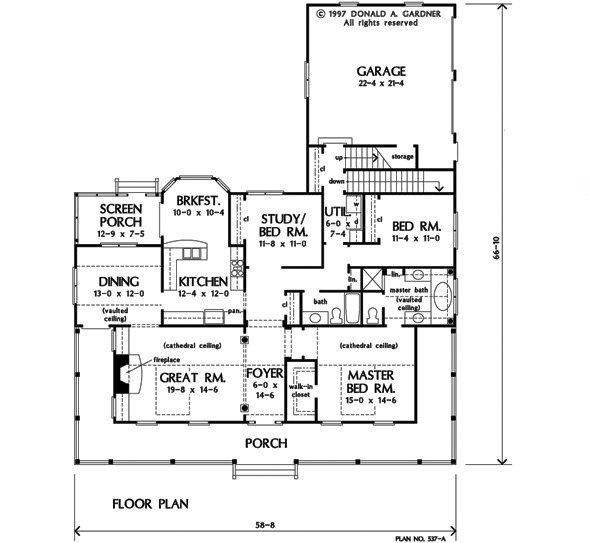 The vaulted dining room features access to the wrapping front porch, while the screened back porch is entered from the breakfast bay of this house plan. Like the great room, the master bedroom features a cathedral ceiling and clerestory dormer, and its private bath is amplified by a vaulted ceiling. 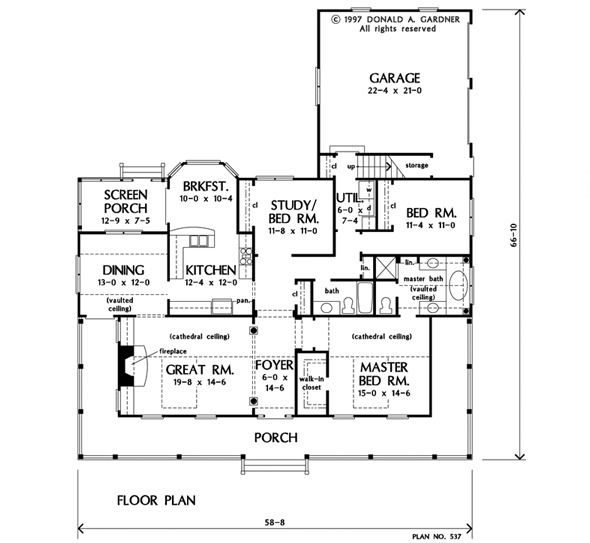 A smart utility room separates the flexible study/bedroom from the third bedroom, and a bonus room over the garage provides options for expansion in this house plan. 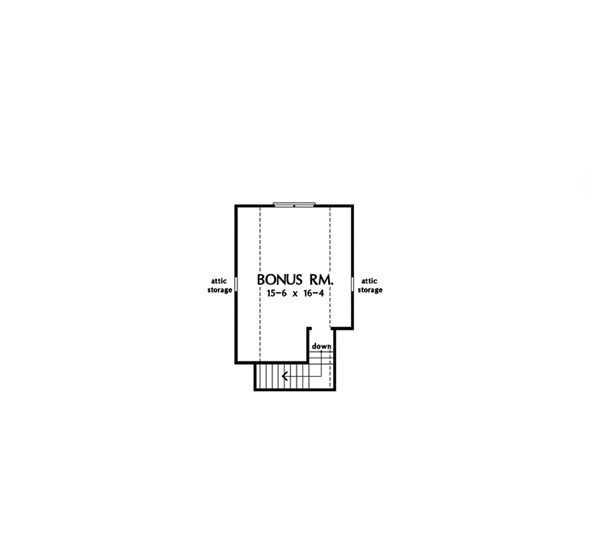 1st Floor: 1899 Sq. Ft.
Porch - Screened: 107 Sq. Ft.
House Dimensions: 58' 8" x 66' 10"
Great Room: 19' 8" x 14' 6"
Master Bedroom: 15' 0" x 14' 6"
Foyer (Cathedral): 6' 0" x 14' 6" x 18' 3"
Dining Room (Vaulted): 13' 0" x 12' 0" x 11' 8"
Great Room (Cathedral): 19' 8" x 14' 6" x 18' 0"
Kitchen : 12' 4" x 12' 0" x 9' 0"
Utility Room : 6' 0" x 7' 4" x 9' 0"
Bonus Room (Vaulted): 15' 6" x 16' 4" x 8' 0"
Garage Storage : 7' 6" x 3' 4" x 0' 0"
Master Bedroom (Cathedral): 15' 0" x 14' 6" x 18' 0"
Bedroom #2 : 11' 4" x 11' 0" x 9' 0"
Porch - Front : 58' 8" x 6' 4" x 0' 0"
Porch - Left : 6' 0" x 14' 10" x 0' 0"
Porch - Right : 6' 0" x 14' 10" x 0' 0"
Porch - Screen : 12' 9" x 7' 5" x 0' 0"